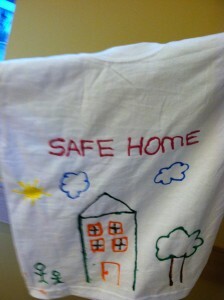 Domestic violence should not happen to anybody but it does – and when it does, people need to know that there is help. Maybe you know someone who has lived with abuse, maybe it happened just once; maybe you work or live next to someone who is being abused right now, maybe you just want to advocate for those without a voice. Whoever you are, it is important to remember that domestic violence is EVERYONE’S business and change happens through awareness. October is domestic violence awareness month and CHC’s domestic violence services operate through New Horizons; Each year, New Horizons shelters approximately 140 people, adults as well as children, and serves over 800 people throughout Middlesex County. -1 in 3 women will be a victim of domestic violence in their lifetime. -3 to 4 million women are beaten in their home each year. -It is estimated that a minimum of 3 million children in the US witness domestic violence each year. 1.FUNDRAISER at Cold Stone Creamery: Come TODAY, Wednesday, October 24, 2012 from 4PM to 7PM to support New Horizons’ services. Located at 100 Riverview Center #125 in Middletown, CT, come help support New Horizons Domestic Violence Services, while enjoying delicious ice cream, and entering in a raffle to win a great gift basket. 2. Purple Tie Tuesday: On Tuesday, October 30, 2012, New Horizons is asking all men to show their committment to ending domestic violence by wearing a purple tie. As one of the 18 domestic violence agencies across the state, New Horizons’ knows the importance of engaging men in their efforts to end domestic violence. 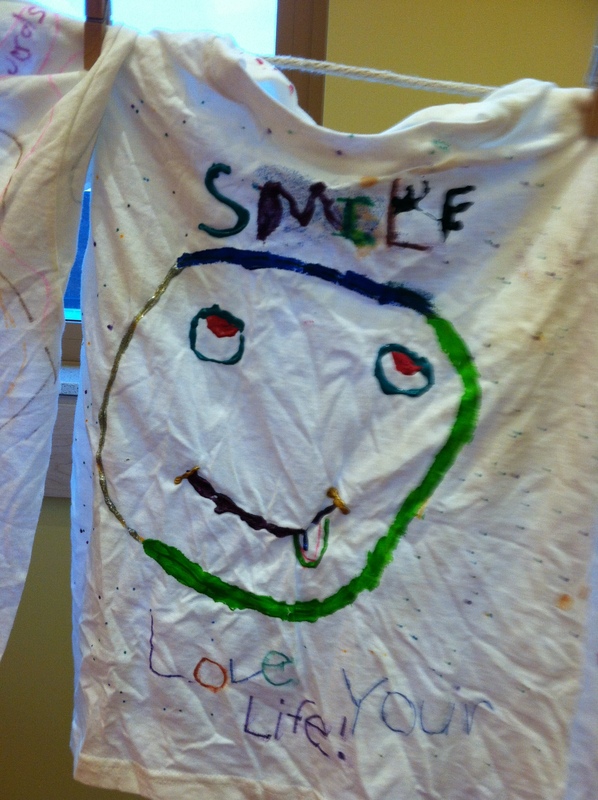 How and why did this project start? 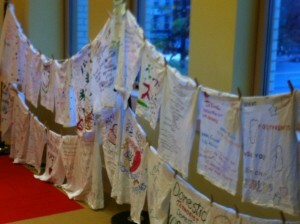 The Clothesline Project was created by the Cape Cod Women’s Agenda in MA in 1990. The group decided to establish its own tribute for women after one of the members visited a traveling exhibit about the Vietnam Memorial. When the woman discovered that 51,000 women in America were killed by the men who supposedly loved them during the same period 58,000 men were killed in the Vietnam War, they were convinced that the public needed to learn about the casualties that were happening right here at home. 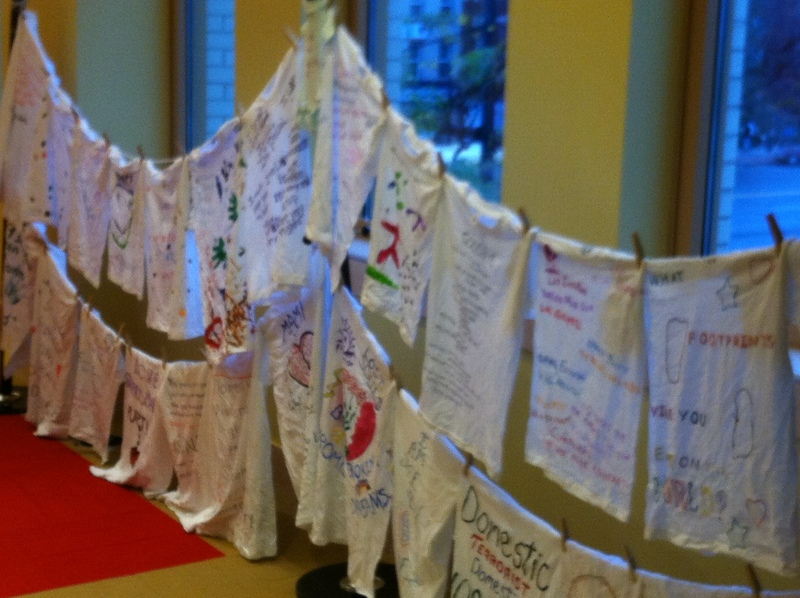 In addition to helping survivors, one of the main goals of The Clothesline Project is to educate the general public about the magnitude of the problem of violence against women, and to testify to the impact it has on the individual, their families, and their friends.